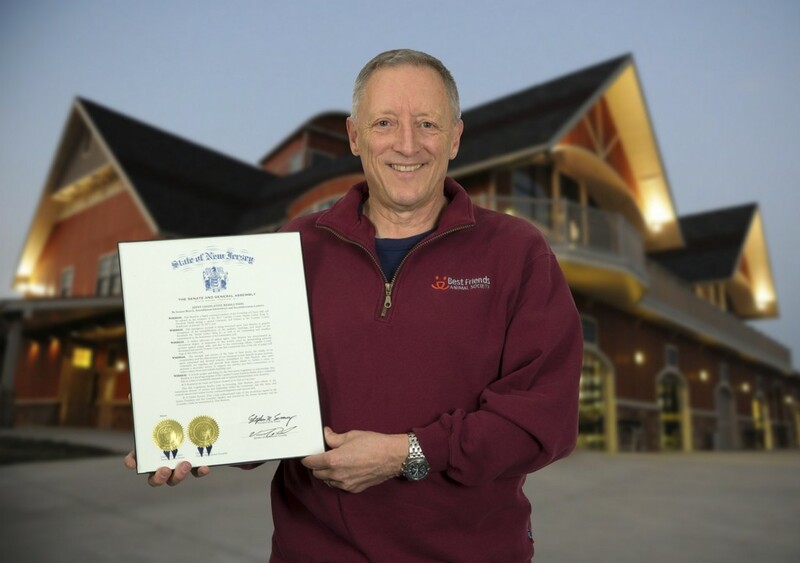 Braslow was awarded the 2017 Camden County Martin Luther King Jr. Freedom Medal for leading the effort to have municipalities in New Jersey restrict the sale of dogs from puppy mills. For many years, Cherry Hill resident Alan Braslow had volunteered with various shelters and recues with his wife Elaine. However, a national news story in 2007 motivated him to move from volunteer to activist. That year, National Football League quarterback Michael Vick was arrested and charged with operating an illegal dog fighting operation at a property he owned in Virginia. Seeing this story changed Braslow. “It made me absolutely sick to see what was going on,” Braslow said. A short time later, Braslow visited Best Friends Animal Sanctuary in Utah, the largest no-kill sanctuary for companion animals in the United States. “Even though I had a passion for animals, I had to find the time to become actively involved and constructively involved,” Braslow said. Nearly a decade later, Braslow has become a very involved animal activist in New Jersey. His recent work on trying to get government to regulate the sale of puppy mill animals was recognized when he was awarded the 2017 Camden County Martin Luther King Jr. Freedom Medal. Braslow’s volunteer efforts have benefitted animals in numerous ways. Braslow has participated in PetSmart Charities Rescue Waggin’. The program transports homeless dogs from areas with few potential adopters and sends them to shelters across the country. The program has volunteers who help the team prepare the trailer for the dogs so they can be transported safely. Braslow had to receive Federal Emergency Management Agency certification and take other courses prior to volunteering. “We would set up the facility so that the dogs that were being rescued, they would have their crates and bowls and everything,” Braslow said. Some of the projects Braslow participated in with Rescue Waggin’ were raids on puppy mills and other facilities keeping dogs in inhumane conditions. Braslow recalled one raid in Columbus, Ohio, on a facility claiming to be a rescue. The facility was actually keeping more than 300 golden retrievers in horrific conditions. “I could get a call on Friday evening that said, can you be on a plane Saturday morning,” Braslow said. In recent years, Braslow has gotten more involved with a Gloucester County-based rescue named Don’t Bully Us Pit Bull Rescue. Braslow fosters puppies for the rescue until the dogs are ready to be adopted to families. Much of Braslow’s free time today is spent speaking with government officials and attending public meetings. Braslow helped lead a movement in 2015 to have government pass new laws restricting the sale of animals from puppy and kitten mills. Braslow began the movement when he started protesting outside a pet store named Pat’s Puppies in Cherry Hill during the summer of 2015. In September of that year, Braslow’s conversations with Camden County Freeholder Jeff Nash led to the county passing a resolution banning the sale of puppy mill pets. Two months later, Cherry Hill Township became one of the first municipalities in the area to adopt an ordinance also banning puppy mill pets. In addition, Braslow worked with the owner of Pat’s Puppies, Pat Youmans, to change the store to a nonprofit rescue shop. Renamed P&T’s Puppy Love Adoption Center, the store adopted about 1,000 dogs in its first year of operation. Braslow’s efforts have taken him across the state, where he is trying to get dozens of municipalities to pass similar laws on pet sales. “I’ve been to more than I can count town council meetings to present in a calm, professional way why the ordinance will be good for the town,” Braslow said. Braslow said nearly 100 municipalities across the state have adopted ordinances restricting the sale of puppy mill dogs. In addition, Braslow hopes Camden County will soon be the first county in the country to have every municipality pass such an ordinance. Stratford and Haddonfield are the only towns left in Camden County who haven’t passed the ordinance. Stratford is scheduled to vote on adoption of its own ordinance Feb. 14, and Haddonfield officials have also considered adopting one. “I’m thrilled we’ve gotten as far we have,” Braslow said. Braslow was unable to accept his Freedom Medal at a Jan. 18 ceremony in person, as he was out of town at a work meeting. His daughter, Sara, accepted the award for him. Braslow is hoping the medal helps further his efforts to get more ordinances and maybe a state law passed on the sale of puppy mill dogs. He is also hoping to help other pet store owners convert their businesses to a rescue model similar to P&T’s in Cherry Hill.